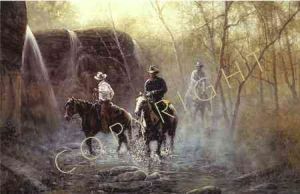 One of the most difficult aspects of cowboying can be the weather. Fog can be particulary difficult when looking for stray cattle. This morning in West Texas was one of those days. Thankfully, the sun broke through the clouds mid-morning and visibility improved. We gathered the remaining strays and completed our round-up to the satisfaction of the foreman whose job it was to account for every head of livestock along the "Misty Trail."